I am teaching Grade 10 Applied math and this will be the third time that I have taught this curriculum by spiraling. I have learned and followed Mary Bourassa and Alex Overwijk and I thank them profusely for all of their ideas that have inspired me to work on this during the last two years. I’m pretty confident about spiraling again and I believe the feedback from students have helped me shape this into a solid and great way to teach Grade 10 Applied. The highlight of my Grade 10 applied class this week was working on 26 squares and the first activity using the squares – perimeter/side length model. They didn’t have any problem coming up with the equation of the line: P = 4L. They also didn’t have any hesitation telling me that if the side length was 50, the perimeter would be 200. 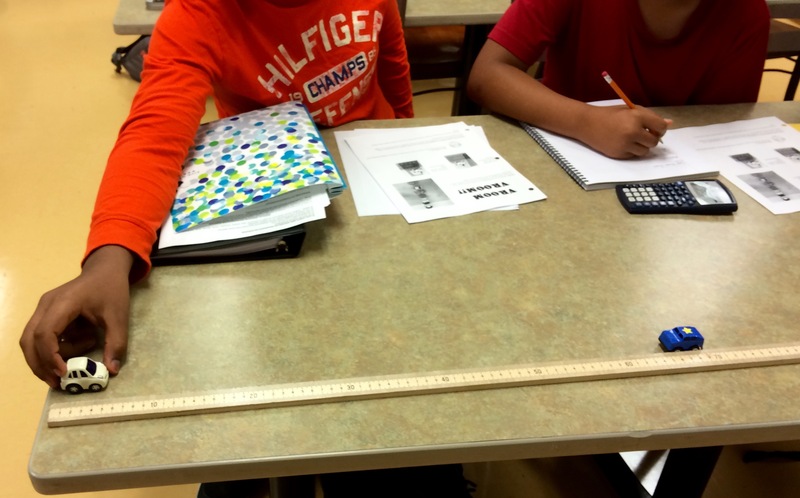 There was some hesitation on finding the side length when the perimeter was 248. Then a boy yelled out “Oh, I know – it’s 62 cm!”. 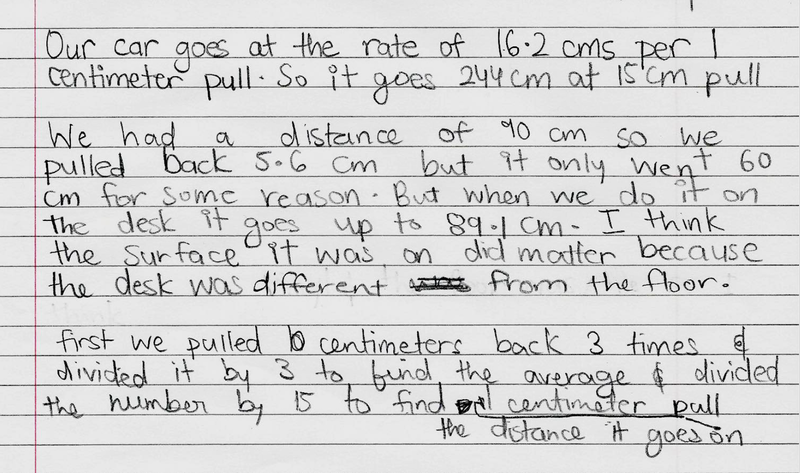 I asked him how he knew and he said, “It’s easy – I knew that the perimeter was 200 for a side length of 50. I know that 248 is 48 cm more and that would be a side length of 12. So I added 12 to 50 and got 62.” Cool, don’t you think? The Grade 9 academic class is a good size – sitting at 33 right now. I love the Grade 9’s at the start of the school year. They are so timid and compliant. I suppose this should last about two weeks. I actually look forward to the kids opening up and being comfortable with talking in class. We talked about the cycles that we will be working through and I have started talking about how I grade using only feedback and mastery of the learning outcomes and not actual marks. They seemed to be okay with this so far…. I think they understand idea of demonstrating the most recent and most consistent evidence of what they know and that I’m into slow math – not how fast can we learn this stuff. We started our first class with the Vroom Vroom activity with the pull-back cars. I didn’t give them any directions and only told them about their challenge that would take place near the end of class. I really wanted to see what they would come up with on their own. They seemed to enjoy the challenge and because of the size of the class, we only had time for one distance challenge. They were asked to submit a mini-report for each team. Here are some pictures I took while they were working. My favourite picture is of the team coming up with a solution to their car always turning after a certain distance. 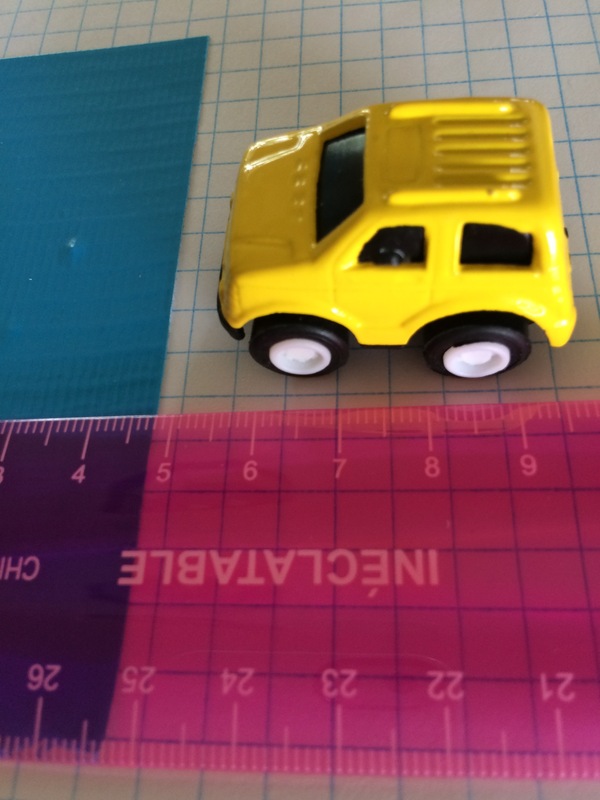 They created a “track” for the car to go along against the wall – problem solvers! 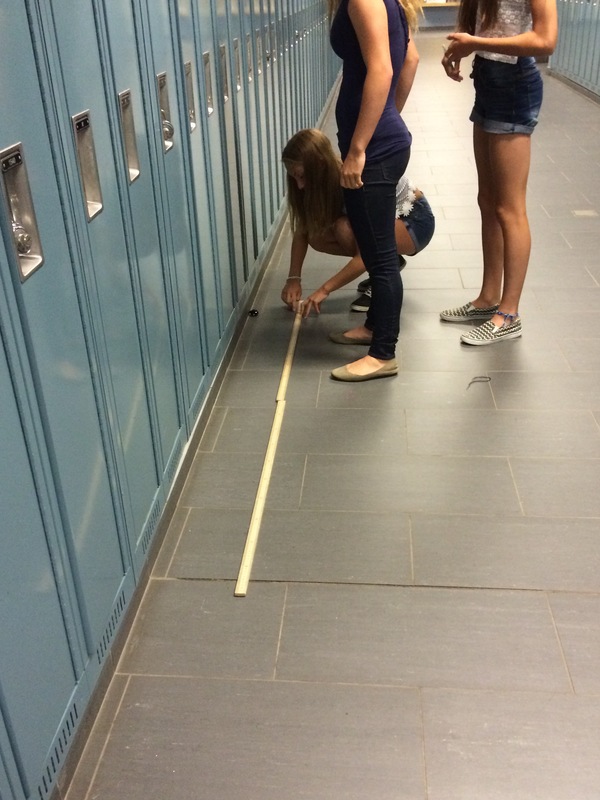 I loved that after I announced the distance I would be using for the contest, several teams rushed to the hallway with their cars and metre sticks for trial runs of using their pull-back distance they decided on. An interesting observation on how conditioned our students are to doing what they hope is “right” and finding the right answers. On every table, I put out lined paper, graph paper, whiteboards, metre sticks and a car. Several of the teams handed in graphs with their report – most of them being bar graphs. Despite being pretty graphs, they did realize that the graph didn’t help them much with their predictions. Some of the students even admitted that they included a graph because they didn’t want to lose marks. That began my reiteration of how I have no marks, only feedback and so on.…cycling seems to be necessary on more than just curriculum content. 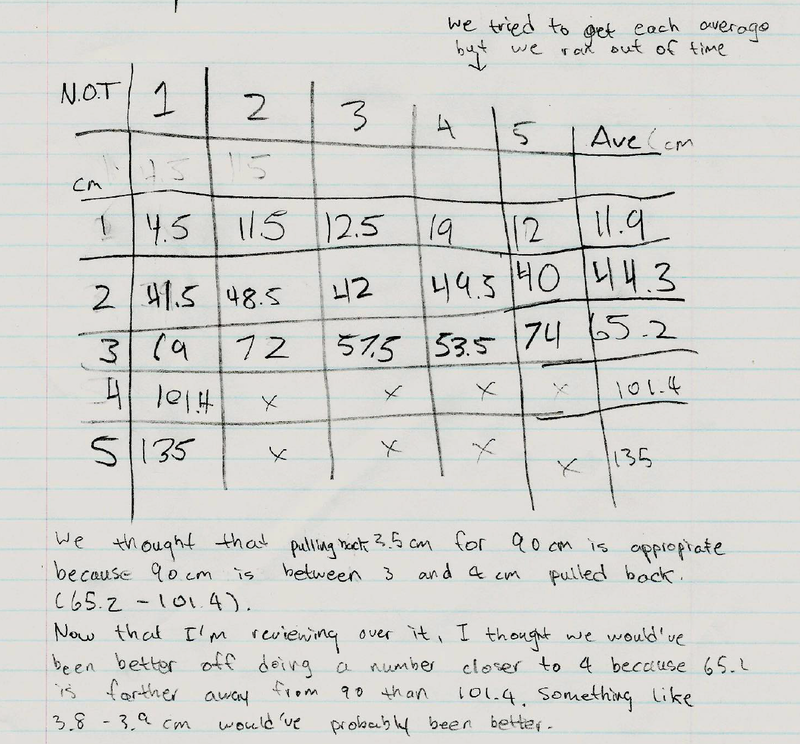 Here are some highlights of the mini-report – remember – this is their first day of math class. 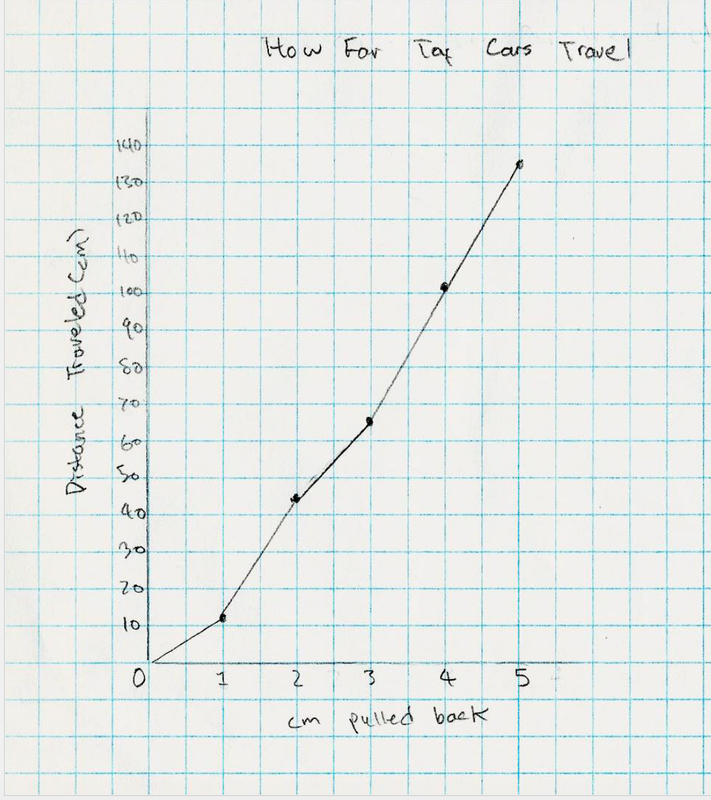 You can already see evidence of some thinking around proportional reasoning and I loved the team who tried to do an average of five trials for each pull back distance! 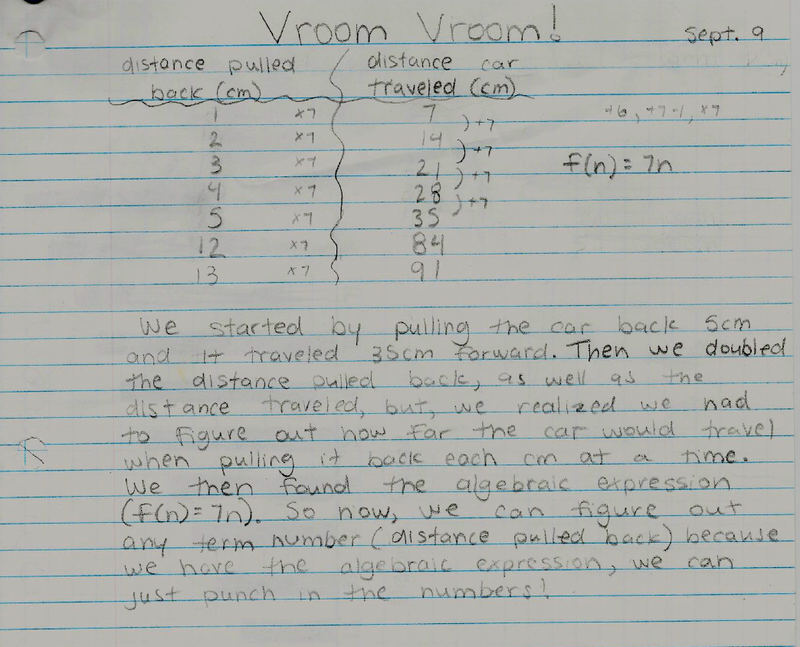 We finished up the week with more activities that explored relationships between variables. We started the routine of our warm-ups (thanks to Mary Bourassa again!) and introduced them to open ended questions, using the vertical (or horizontal) non-permanent surfaces, and how Kahoot can be their quick route to an overdose of sugar. It is only the first week – but I am really looking forward to working with this group of Grade 9 students for the rest of this semester. I hope you can also see why.